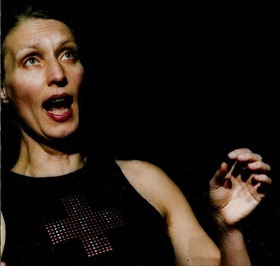 Vocal artist Ute Wassermann is a composer/performer, improviser and interpreter of contemporary music. She studied at the Hamburg Academy of Fine Arts with Henning Christiansen, specializing in sound installation and vocal performance, and studied classical singing with Carol Plantamura (San Diego) and Arnold van Mill (Hamburg). Since 1984 she developed many special multivoiced vocal techniques, catalogued by register, timbre and articulative sequences which may be deconstructed and/or superimposed and used to explore spatial resonance phenomena. She has given numerous performances of her own solo work and performs regularly with many improvising musicians including duos with Richard Barrett (live electronic), Aleksander Kolkowski (strohviola, musical saw) and with Birgit Ulher (trumpet) in venues ranging from international festivals (Japan, Australia, Hongkong, Buenos Aires) to lofts. She has collaborated frequently with composers who have created works especially for her voice, including Henning Christiansen, Richard Barrett, Chaya Czernowin, Hans-Joachim Hespos, Sven Åke Johansson, Ana Maria Rodriguez and has performed with many ensembles and orchestras including ASKO, KNM Berlin, ELISION, and Münchener Kammerorchester. Recent projects have included performances of "code*switching" for voice, computer and video installation by Ana Maria Rodriguez, a staged production of Savatore Sciarrino's "Infinito Nero" (with KNM Berlin) and the completion of a cd of her own solo and multi-track vocal compositions.